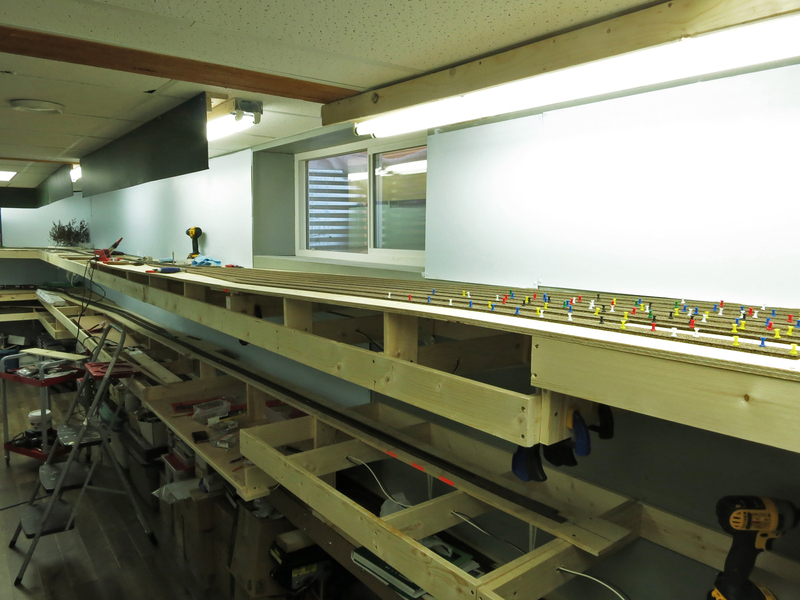 Another Milestone: Upper Level Benchwork Completed! 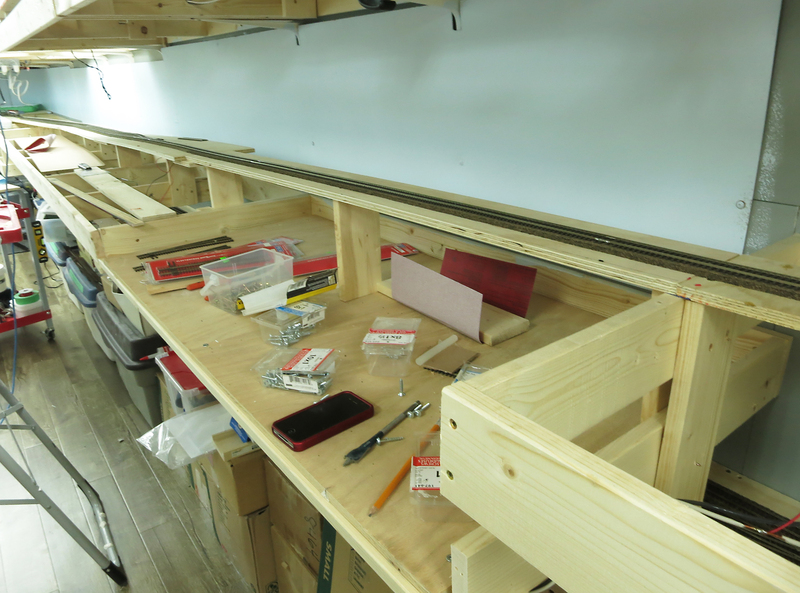 I reached another milestone in construction this morning, all of the bench work for the upper deck is complete! 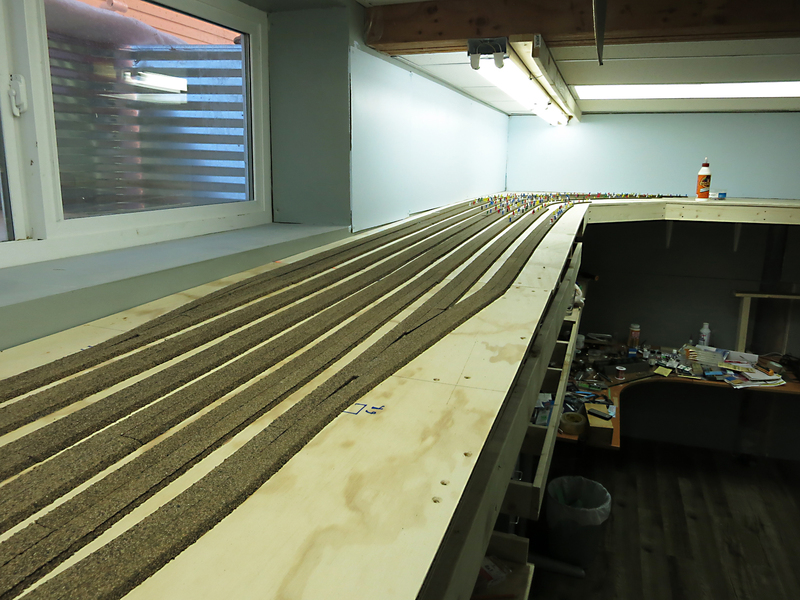 I’ve started to lay the cork roadbed for Tacheeda, which on the prototype was a small yard where coal trains off of the Tumbler Sub swapped power. On my layout Tacheeda will be the start of the staging tracks, but will also have a section of catenary for the electric GF6 locos that ran on the Tumbler Sub. I was planning on having a back track at Tacheeda for power to lay over, however room is tighter than expected and with a reverse loop in the picture I’m not sure if I can work these tracks into the plan. Here’s the North end of Tacheeda yard, which will consist of 8 tracks. And a veiw of the yard from the other direction. Notice the grade coming into the yard. This is due to the height of the upper deck increasing to around 62 inches off of the floor. 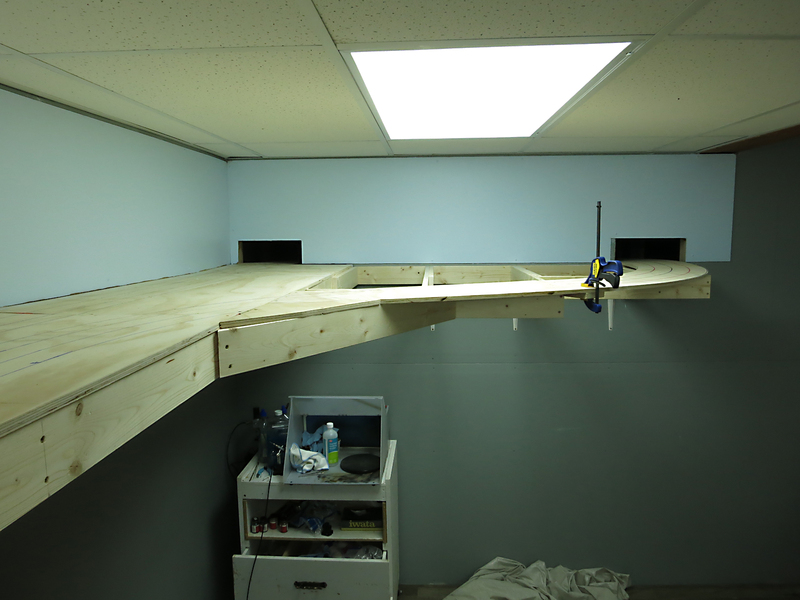 I had to raise both upper and lower decks slightly to allow for my work table to fit under the layout. The extra height at Tacheeda shouldn’t be a problem for operations, since the yard is basically staging for trains. And, over (ok actually below) on the Dawson Creek Sub, I’ve built a passing siding (Groundbirch) and roughed in the location of the Howe truss bridge at Kiskatinaw. The bridge is from Hunterline, and will likely take me about 20 years to build! 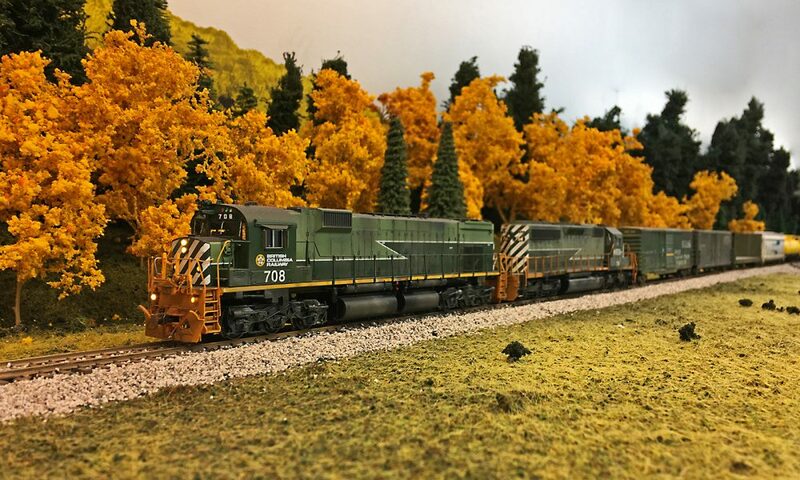 I’m going to run to the hobby shop this week for some more cork, and plan on doing some steady track work to get the upper deck functional, since its a lot easier to finish the track on the upper level before the last of the bench work for the lower is built. This entry was posted in Layout Construction, Uncategorized by tsokolan. Bookmark the permalink. 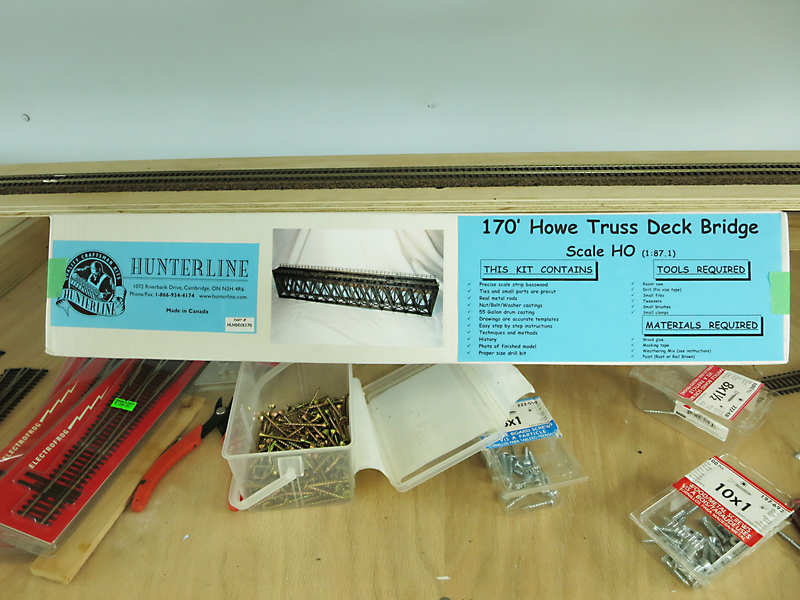 Don’t be scared of the Hunterline kit…picking away at it an hour or two a weekend I’m close to done within a year, including piers and trestle approaches!